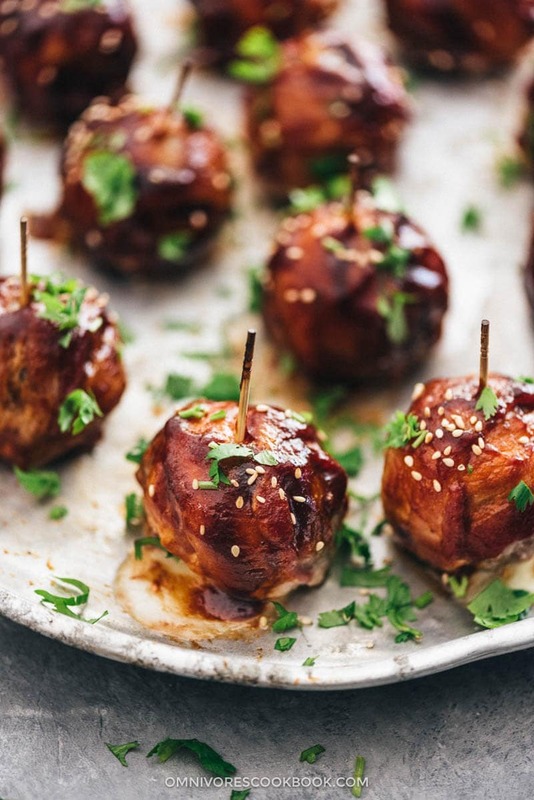 Celebrate summer with these cheesy, juicy, crispy BBQ sausage bites! Let’s face it, real-deal Chinese cooking requires a lot of prep time and it’s not very practical to do it on a daily basis. Back in China, we did make a lot of dishes from scratch, because there aren’t many products available to make shortcuts. After moving to the US, I gradually learned about more food brands and how easy it is to cook with them. Nowadays we hoard jars of pickled artichoke, sun dried tomato, and canned fish for making salads. And I use jarred tomato sauce and bottled BBQ sauce to whip up a quick dinner or when hosting a casual backyard party. Today I want to bring you a fun recipe made with Kingsford® Original Smoked Hickory BBQ Sauce. I’m a loyal fan of Kingsford and I’ve been using their charcoal since I first started grilling. I was so excited when I heard they just announced their own line of BBQ sauce and was invited to try out one of their recipes. The sauces are made with real ingredients and are gluten-free. 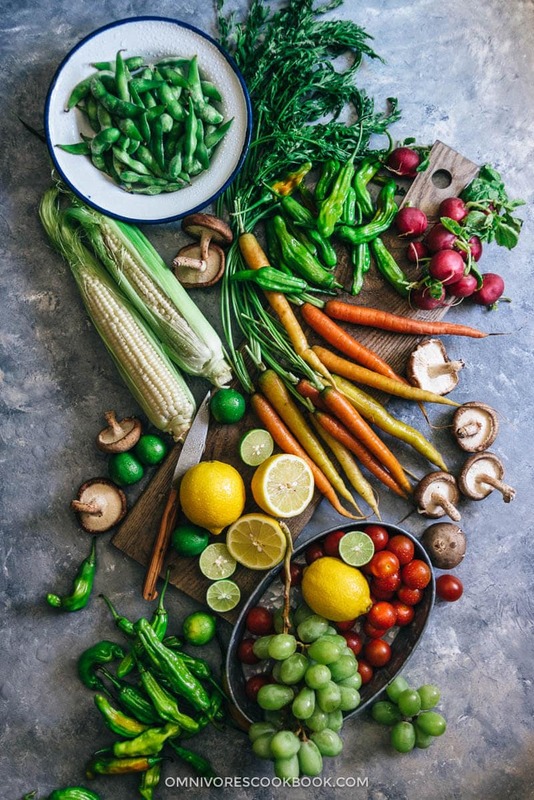 You won’t find chemical additives in the ingredient list. The sauces have a fantastic balance of spices and work great on all sorts of ingredients. Their smokiness is heavenly! I bake chicken thighs with them for weekday dinners and the results are as wonderful as grilled ones. 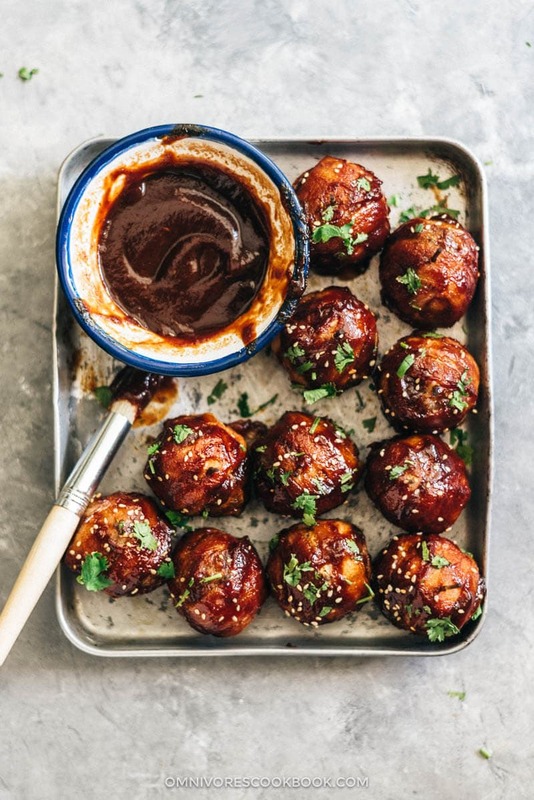 I used the sauce to create these cute little cheesy BBQ sausage bites. 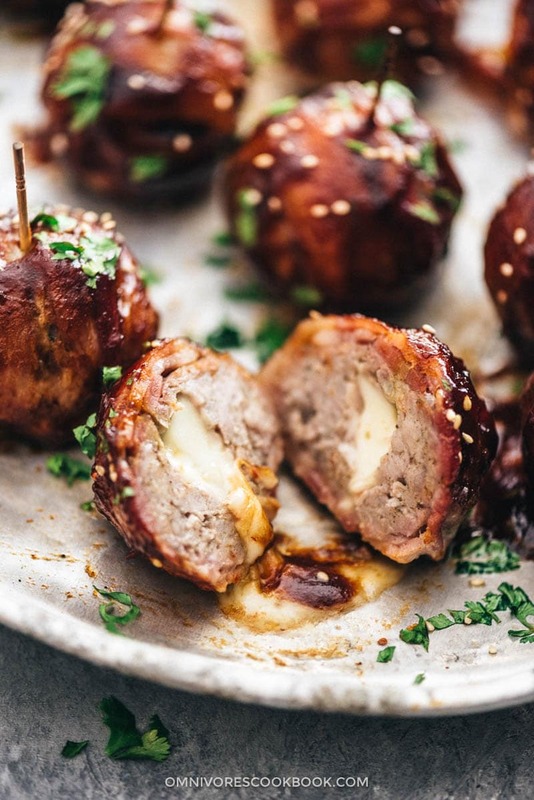 It contains everything I love: juicy sausage and melty cheese wrapped with crispy bacon, brushed with a smoky sauce. 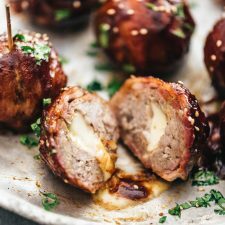 These sausage bites are so fun to make, easy to prepare ahead, and perfect for a summer grilling party. 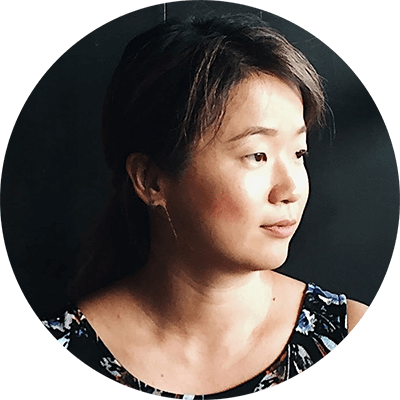 Back in Beijing, I never hosted a grill party, because most people live in apartments and do not have access to grilling equipment. I was invited to my first grill party right after moving to Austin, and I took it very seriously when my husband announced the event to me. Since everybody brings food, I only needed to prepare 2 to 3 things. I decided to make the Chinese signature BBQ dish – lamb skewers, along with some grilled wings. I remember running to multiple grocery stores trying to find the right cut of lamb – leg meat with a good amount of fat attached. Then I cubed, skewered, and marinated them in homemade sauce. I butchered the wings and designed a different marinade sauce for them. I also tried to prepare appetizers as an accompaniment, but was stopped by my husband who said it would be too much food. And I also packed every single spice needed so I could finish up the grilling right at the party. It took me hours to plan, prep, and shop. I was stunned when I arrived at the party. Other people had brought bags of tortillas chips, Greek salad from the store, jarred pickles, and simple sandwiches made with cold cuts. I resisted until going home to ask my husband, isn’t everyone supposed to cook something interesting? Turns out, it was me who didn’t understand the American way to have a party. Picnics are for connecting with people and having some fun, rather than forcing my cultural identity on people I just met. Fast forward to 2017 I’ve been living in Austin for two years and have been to and hosted more parties. 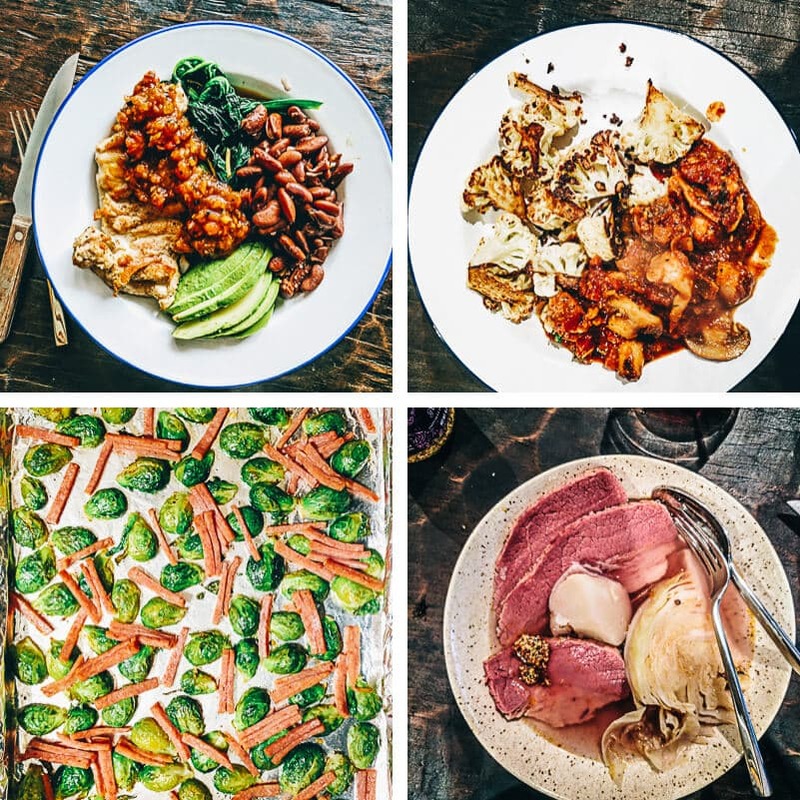 Whenever I host a gathering or cook for a dinner party, I still tend to over-prepare. 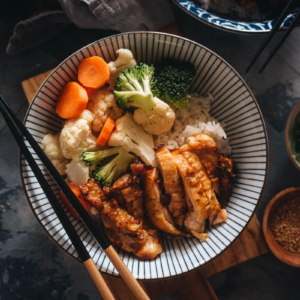 That Asian part of me is too deeply rooted in me and difficult to change… However I’ve got a much better idea of what my American friends like eating and how to host a party like a local. 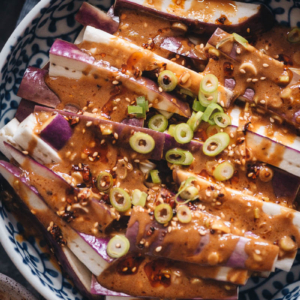 Prepare some snacks to serve, such as crackers, cream cheese spread, and pickles. So when all my friends arrive and I’m ready to grill, the bulk part of the platter is done. 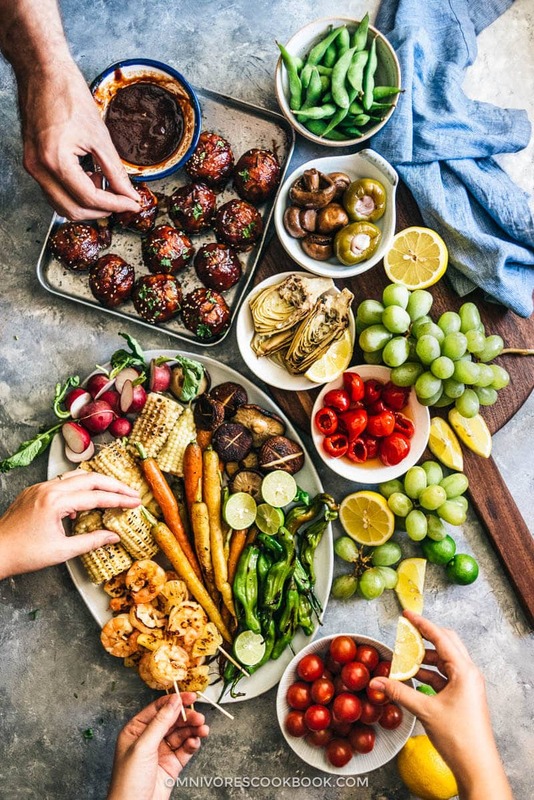 I simply need to fire up the grill, cook the sausage bites at the side away from the direct heat while searing the vegetables over the open flame. Happy cooking and I hope you enjoy these sausage bites! If you gave Kingsford® Original Smoked Hickory BBQ Sauce a try, click here to leave your comment to let Kingsford know what do you think of the sauce! Recipe created by Clint Cantwelll on behalf of Kingsford® Charcoal. I added some more notes under the recipe, based on my own cooking experience. 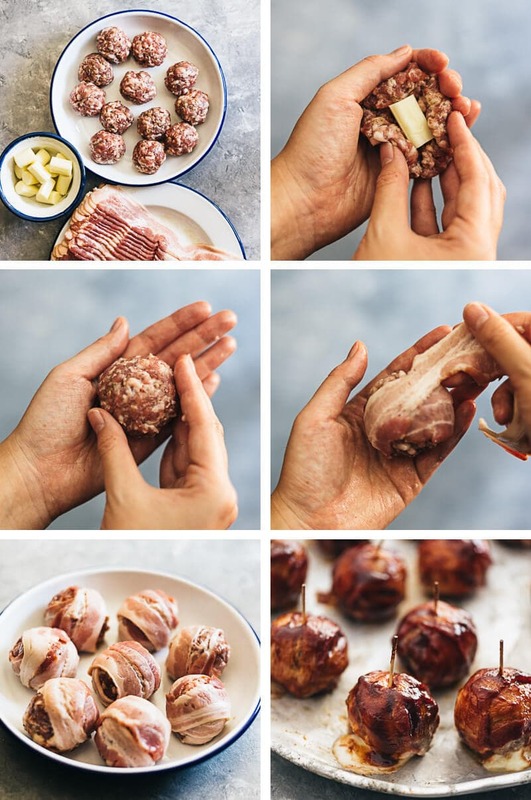 Place the bacon wrapped meatballs onto the cool side of the grill, cover the grill and allow them to smoke for approximately 20 minutes. 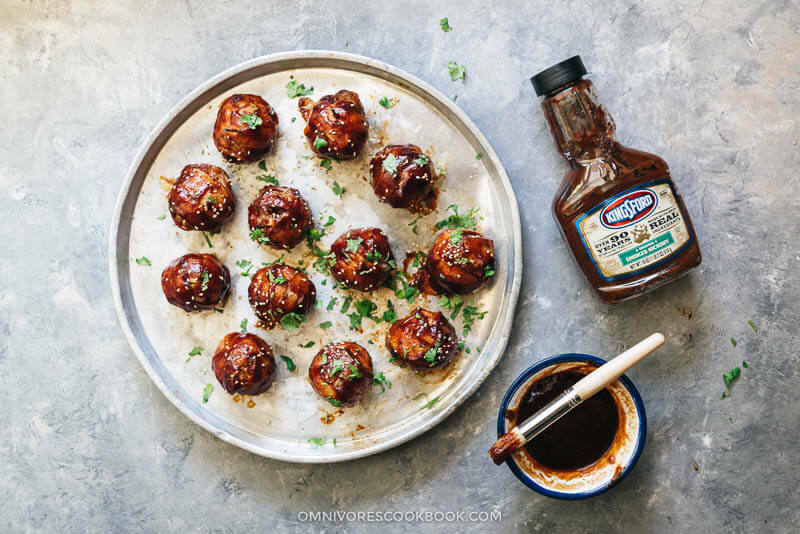 When until they are cooked through and the bacon is nicely browned and crisp (Footnote 4), brush meatballs with Kingsford® Original Smoked Hickory BBQ Sauce, cover the grill, and allow the sauce to set for 2 minutes. Remove meatballs from the grill and serve immediately with additional BBQ sauce. I prefer to use un-cured thin cut bacon to cook this dish. The tender bacon will easier to wrap, and it crisp up better. 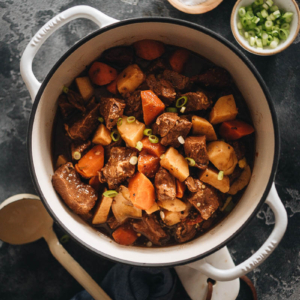 My husband loved this dish so much, so I’ve cooked it several times since I tested the recipe. I found out the result was as wonderful even when you bake the sausage bites - bake at 350 degrees F (176°C), brush sauce, then turn on broiler to cook for another 2 minutes. I highly recommend you to use bacon to cover as much sausage as possible. The bacon will keep the sausage juicy, and it renders more fat. If the bacon hasn’t crisp up, move them to the flame side of the grill to sear for 1 to 2 minutes. This is a sponsored conversation written by me on behalf of Kingsford. The opinions and text are all mine.